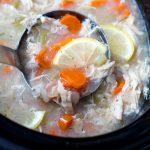 After seeing so many slow cooker crack chicken recipes floating around on Pinterest, I knew I had to make my own….and it totally lived up to its name – so addicting! I know you’re going to love this new recipe, Friends. 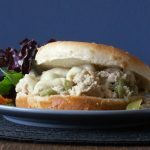 Does anyone else love looking for new recipes ideas on Pinterest? I noticed a bunch of pins for “crack chicken” and had to find out more. After comparing a new few recipes I learned that most crack chicken recipes call for four simple ingredients: chicken breasts, dry ranch seasoning, cream cheese, and bacon. I mean, with those ingredients it’s easy to see why it’s addicting, right?? I decided to give the recipe my own spin by using my homemade dry ranch seasoning mix. It’s super delicious, healthy, and budget-friendly. (You can see all of my homemade spice mixes and sauces in this blog post.) I also used real bacon bits because I wanted to be able to freeze the recipe without any cooking ahead of time. If you have leftover bacon or a desire to cook your own – go for it! The olive oil and red wine vinegar add just a bit of liquid while cooking. The final product was a creamy, flavorful, and simple dinner. I think this will be a winner with your whole family. Enjoy! This recipe can be cooked fresh or assembled and frozen (raw) to cook later. 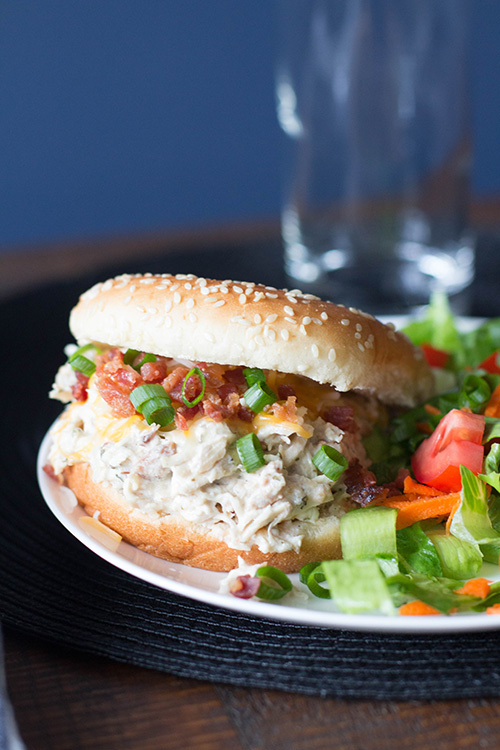 Serve on hamburger buns with shredded cheddar cheese, extra bacon bits, and sliced green onions. Add all ingredients, except cream cheese, to crockpot and cook on “low” setting for 4-6 hours. Label a gallon-sized plastic freezer bag with the name of the recipe, cooking instructions, and use-by date. Add all ingredients except cream cheese and remove as much air as possible. Seal and freeze for up to three months. This looks wonderful! 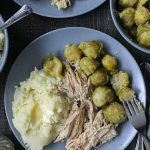 How would you convert to Instant Pot? 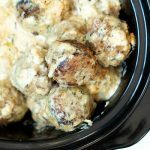 I would just use my Instapot as a slow cooker, also, to increase the fat (more Keto) I would use chicken thighs– my husband likes the thighs, as a rule, anyway! They are much harder to shred, but it’s all about being Keto, right? 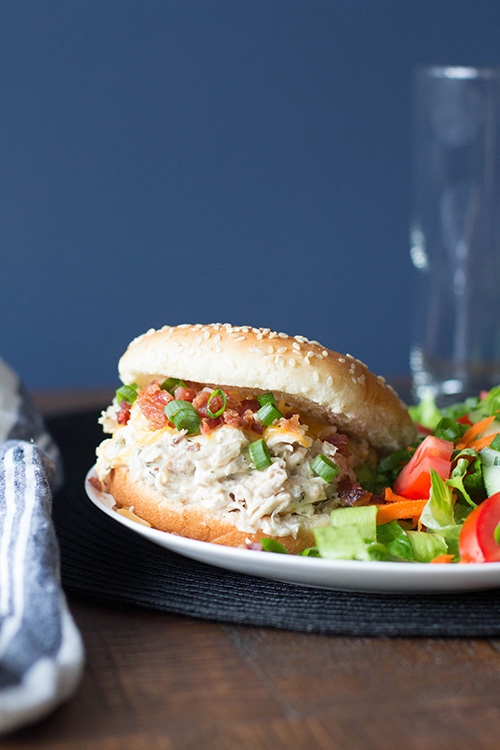 Try using a hand mixer to shred the chicken. MY HUSBAND LOVE THIS RECIPE. HE LOVED IT AND ENJOY IT. Question, do i have to use the cream cheese? I’d rather keep my dish dairy free. Should i add something else in its place? Thank s in advance. I would just pick another recipe. Just search this site for “chicken”! I would add Vegan cream cheese. If you’ve not tried the Tofutti brand of Vegan cream cheese – do so. It is not bad and in a recipe like this, it will add the creaminess without the dairy. You mention that this needs ranch dressing mix in the text, but you don’t list it or amounts in the ingredients list. How much Ranch? My homemade ranch seasoning is included in the recipe. It’s the spices parsley – salt. Followed directions but this completely burned before I could add the cream cheese. There’s no liquid! Now I have a charred mess in my crockpot. I would definitely cook for less time if you ever make it again. Actually I would decrease for any chicken recipe that you make. It sounds like you have a high-powered crockpot.